In the astrophysics community, the only thing hotter right now than exploring the mysteries of dark matter is the search for exoplanets—those curious and bizarre worlds orbiting other stars. This is the realm of the “exoplaneteers”: hard-working astronomers on the hunt for worlds of all kinds, but especially “Mirror Earths”: planets of water and rock that might even support life. 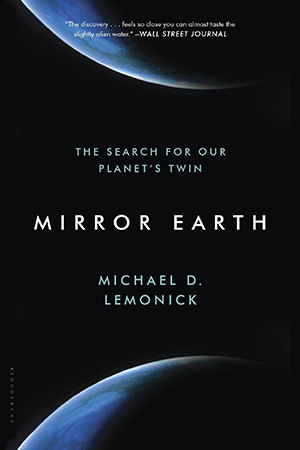 Science journalist Michael D. Lemonick, author of Echoes of the Big Bang, introduces readers to the painstaking science of planet-hunting, as well as the researchers who’ve taken up the quest. A “Mirror Earth” should be rocky, Lemonick explains, and located within a star’s habitable zone—that “just right” Goldilocks orbital range where the star’s temperature allows for liquid water on the planet’s surface. A Mirror Earth also needs to be about the same size as our Earth, with a similar composition, and thus massive enough to hold onto its atmosphere—one that’s neither too thin, nor too dense. This is a fairly demanding list of conditions to be met. But before you can worry about the conditions on your distant exoplanet, Lemonick says, you have to actually find it. Because exoplanets are small and dim compared to their stars, they are nearly impossible to find. Astronomers have to dig deep into their bag of tricks for indirect methods of discovering those mysterious, remote worlds. Lemonick shows that spotting exoplanets demands patience, precision, and—ideally—a space-borne infrared telescope, although radio telescopes come in handy too. The recent transit of Venus across the Sun gave astronomers the chance to try out their planet-hunting technique on something reliably close to home. During a transit, the planet’s orbit takes it across the disk of its star. By measuring how much the star’s light dims during transit, Lemonick shows how astronomers can not only detect an exoplanet, but get an idea of its size. Another method requires precise measurement of the star’s position. By looking for the tiny “wobble” of a star as a planet orbits around it, researchers can identify the exoplanet and figure out how massive it is. Measuring the radial velocity of a star’s surface as it rotates can also reveal the gravitational attraction—and thus the presence of exoplanets. Swiss astronomer Michel Mayor took the prize for the discovery of the first exoplanet in 1995. Mayor’s planet, orbiting 51 Pegasi (the 51st brightest star in the constellation Pegasus) was a big wake-up call that our understanding of how solar systems form had more than a few holes in it. Mayor’s planet was just the first of many “hot Jupiters” and bigger “hot Neptures” discovered: enormous, gaseous, and orbiting much, much closer to their stars than any astronomer could consider normal. Yet subsequent discoveries showed it was indeed typical. Turns out our solar system is the weird one, and we still have a lot to learn. Lemonick relates the short but dynamic history of planet-hunting with high energy and humor. Along the way, he also introduces some of the hard-working “exoplaneteers” at work, vividly sketching personalities from Bill Borucki, a mild-mannered, soft-spoken “anti-[Neil deGrasse]Tyson” of astrophysics and UC Berkeley’s Geoff Marcy, the most prolific planet-hunter in human history; to ground-breaking women like cosmologist-turned-exoplaneteer Sara Seager and nurse-turned-astrophysicist Debra Fischer. Currently NASA’s Kepler mission, launched in 2009 and designed for planet-hunting, has spotted more than 2,300 planet candidates, with 72 confirmed, including the first Earth-sized planet to be found in a star’s habitable zone. Is it a Mirror Earth? We still don’t know—but Lemonick shows how astronomers are getting closer every day. Charlene Brusso is a freelance science writer based outside Syracuse, N.Y.